Can I Feed My Tarantula Meal Worms? Like most other spiders, tarantulas eat primarily insects. Their wild diet consists of many different types of insects, from beetles to grubs. Feeding a well-balanced diet in captivity can be more difficult, since many single-insect diets don't provide adequate nutrition. Meal worms are a convenient, readily available food source and can be part of a quality tarantula feeding plan as long as you treat them correctly. Meal worms are the larvae of a small beetle called the darkling beetle. They come in many sizes and more than one variety is available. Young meal worms (called “minis”) are between 10 and 15 millimeters long and are suitable for very small tarantulas. Standard meal worms measure between 20 and 30 millimeters and are better for medium sized spiders. Giant meal worms are suitable for the largest tarantulas. Choose meal worms that have been kept refrigerated, as they will be slower to molt. Meal worms are usually sold in small tubs containing multiple insects--more than your tarantula can eat at once. Excess insects can be stored live in a tub of dry bran or grain and kept in the refrigerator. The cool temperatures keep these insects' metabolisms slow and enable them to stay alive for several weeks at a time. Meal worms kept longer than two weeks may pupate. Meal worms provide most of their calories from fat and protein. Thirty to 50 percent of the nutrition in a meal worm comes from protein and the rest from fat. Don't make meal worms the only food in your tarantula's diet. Instead, feed them along with crickets, silk worms, roaches and other insects. Meal worms can make up 60 percent or more of the diet. 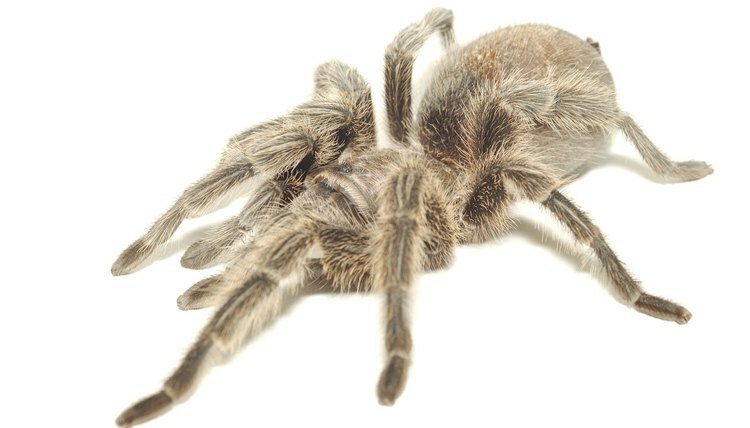 This improves the quality of your tarantula's diet and prevents nutritional deficiencies. Feed your tarantula at least once a week. It's easy to lose meal worms in your tarantula's cage. They will burrow into the substrate and their strong jaws can be a danger to your spider later on. Prevent this by placing meal worms in a heavy cup or dish that they can't crawl out of or by dropping meal worms right next to your tarantula. Watch to make sure all meal worms are eaten and remove uneaten insects right away. They may pupate, grow to adulthood and breed in the cage if ignored.